Good morning sweetie! First of all your words about fixing things and your grandparents brought tears to my eyes this morning... I'm so thankful for the wonderful memories you & I have of our grandparents. Next, ALL your creations are fabulous! The darner is delightful and I love the little bow you put on the lovely painted shoe form, what a great finishing touch. And congrats and being incorporated into RH!! That is incredible and you are so worthy of having your business & wares linked to such a great publication. I'm so proud of you! I feel the same way Celestina about family treasures, things that remind us of the ones we love or remember with love! I find that the older I get the more important those family things become. Thanks for sharing your memories and what they mean to you! First of all...Congratulations for getting to be in Romantic Homes Magazine.I am so excited for you. That is one of my favorite magazines ever. You are so right about God opening doors. As I was reading this post it brought tears to my eyes and a smile to my face thinking about special things that I hold on to because of special memories attached to them. I have several things that belonged to each one of my grandmothers that I will cherish because of them. When I see these simple delights it takes me back to such special times in my life. 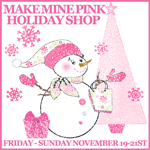 Congratulations for being featured on Make Mine Pink! By the way, could you design another Family sign with yellow roses for me? My dear American Sister loves yellow roses and they so graciously adopted us into their family. That would make the ultimate gift for Christmas, especially made by you! I love it when you share memories of your family Celeste...you are so lucky to have them. The shoe moulds make perfect decorator items especially when you paint them so prettily with roses. Love reading about your happy memories of your dear Family. Oh yes, the Christmas dinners and special times around the family dinning table. Also loved hearing the your Grandfather made shoes, how amazing and that you have the lasts of his. That is so exciting that Romantic Homes contacted you and your pretty creations will go so well in the lovely magazine. Love the beautiful sock darner and shoe mold, Celeste! More of your magic! Funny, but as I read your sweet post, all I could think of was all the lovely little items I have of yours here in my home that ALWAYS bring me such delight!! Simple delights are surely the best! I don't know where to begin with all this beauty! I love the shoe molds & the sweet memories you shared ... how precious to melt a heart. And, what a clever way to use them, hadn't thought of this. The sock darn piece brought back memories of Mother sitting there working on all the socks ... I hope I can find it as you will receive it for a beauty lift, if I do. Congrats on your feature in the magazine, I love it. No one is more deserving than you. I love love love the darner and the shoe forms...well everything you create is beautiful. We all know that. How are you. I have just started to blog again and would love to have you stop in. Hope your Thanksgiving is just amazing.